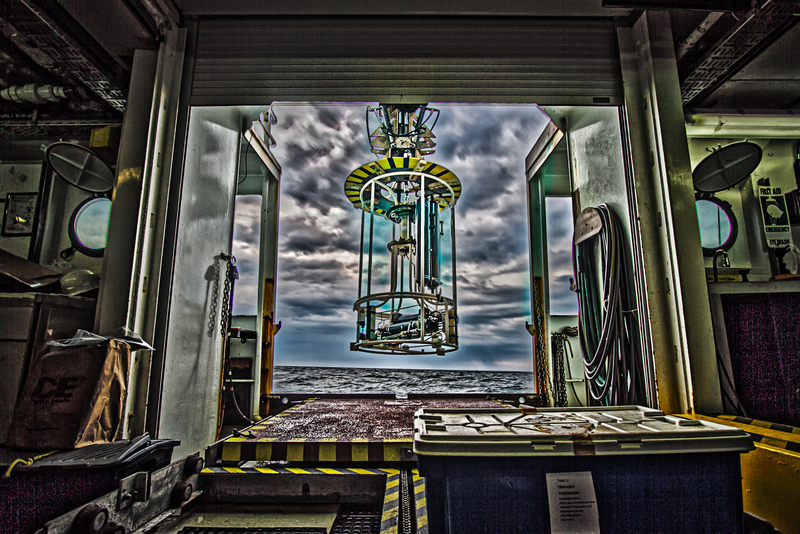 Deploying the Rosette to collect the first water sample for C.T.D. analysis & flying the HabCam V4 was the focus of work on June 15, 2013. The Rosette is deployed so that water samples can be collected to analyze the Conductivity, Temperature, and Depth (C.T.D.) of the seawater, providing data on the physical aspects of the Atlantic Sea Scallop’s (Placopecten magellanicus) habitat. The engineering team assumes responsibility of the Rosette, which is carefully lowered into the ocean through winch operation on the bridge. Once the Rosette has reached near the seafloor, it collects seawater and is then carefully retrieved through winch operation on the bridge. The seawater is then collected into an individual sampling bottle for analysis & calibration of the instrument. Digital image rendering of the C.T.D. 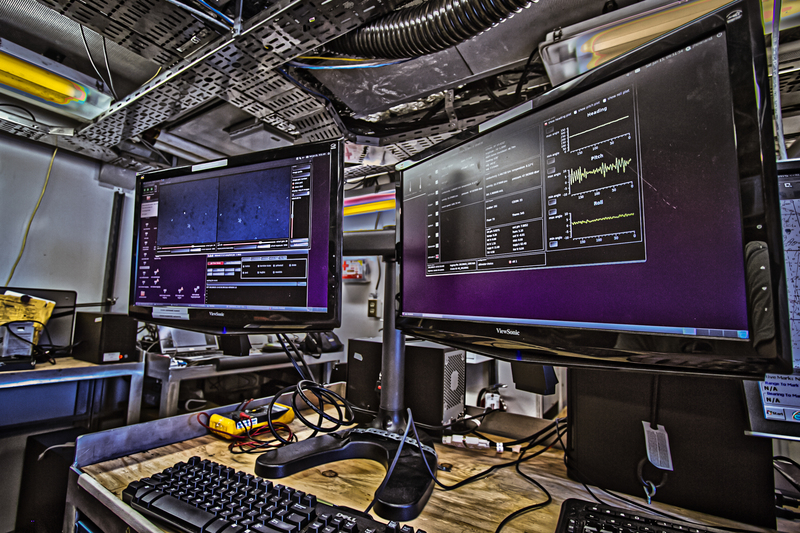 analysis allows for graphic visualization of the gathered oceanographic information, as well as calibration of the instrument. Analyzing the information demonstrates the two distinct layers of the ocean, separated by a relatively abrupt dividing boundary, which defines them. Atlantic Sea Scallops (Placopecten magellanicus) inhabit the seafloor in the lower layer of the ocean, whereas Plankton and Sea Scallop larvae can be found in the upper layer. Presentation of the C.T.D. 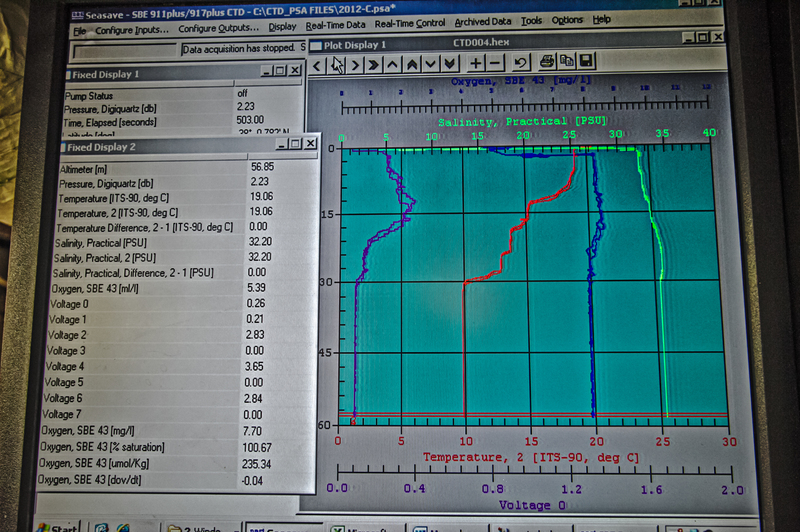 readout gives accurate data of the Voltage (purple), Oxygen (blue), Temperature (red), and Salinity (green) levels. As stated in my previous post, the HabCam V4 takes a tremendous amount of teamwork in order to operate at its maximum capacity. Correspondence with the engineering team is required to launch & retrieve the HabCam V4, the pilot must remain focused on ensuring that the HabCam V4 is close enough to the seafloor for maximum image quality, while at the same time being at a safe distance to prevent accidental collision, and the co-pilot is focused on incoming images & server traffic at a 2-monitor interface. All participating members of the crew must be attentive, communicative, and actively engaged in the contributing activities of other team members at all times. The best way to describe piloting the HabCam V4 is to compare it to a video game, albeit one that has no “extra lives”. There is a pressure sensitive fiber optic cable feed & retrieval control lever that allows the pilot to either decrease or increase the depth of the HabCam V4. It is vital to maintain a safe distance while being in close enough range of the seafloor so that the incoming images are properly exposed and recognizable for the co-pilot. The optimum range is between 1.7 – 1.9 meters +/- 0.2 meters. Piloting the HabCam V4 during satisfactory weather is nearly effortless once having become acclimated to the 5-monitor interface and the control lever. Piloting the HabCam V4 during foul weather is quite difficult, requiring constant conscious concentration on all variables (seafloor depth, HabCam V4 depth, sonar readout, and fiber optic cable feed & retrieval) in order to prevent an accidental collision with the seafloor. Co-piloting the HabCam V4 requires attention to the incoming images, as well as server traffic. Incoming images must be screened so that identified individual species can be time-stamped and tagged for analysis. Using software, the co-pilot can either tag observed species using digital identification markers, or manually input text to identify a particularly intriguing image that they wish to highlight for analysis. It is important to ensure that incoming images are being written to the server for digital archiving and future annotation. 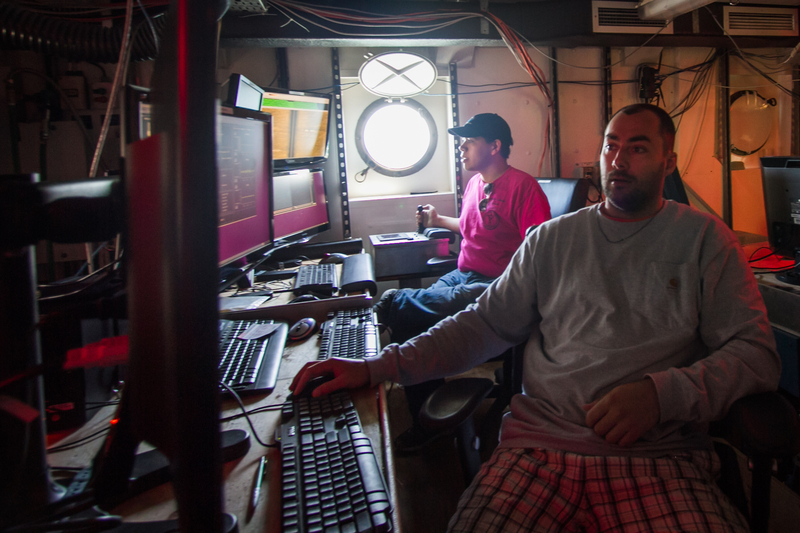 Digital data management, a scarcely celebrated 21st century character trait, is one of the many strengths of the crew aboard this vessel. Despite a few bouts of violent seasickness, I have been having the time of my life while aboard the R/V Hugh R Sharp. The crew possesses seemingly infinite amounts of sincerity, honesty, and intelligence. The continued operation of this wonderfully engineered human machine has occurred without error, and will continue to do so while under the watchful eyes of the leadership heads. Thus far my favorite aspect of this research experience has been co-piloting the HabCam V4. Having vast amounts of digital imagery stream before my observation makes me feel as though I am at home, screening digital images that I stumble upon for both scientific beauty & significance. In addition to the technological aspects of this experience, I have also found solace in the empathetic energy provided by the ship’s captain, Jimmy Warrington. His humor, experience, and leadership create an ideal teaching & learning environment. While many may dread the monotonous nature of a safety briefing, the one provided by the Captain was both engaging and informative. 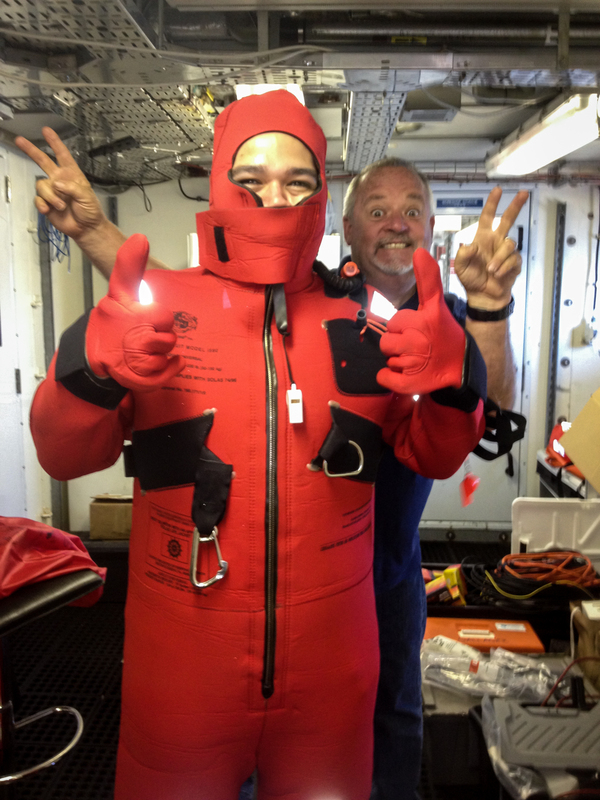 Following safety briefing, newcomers to the R/V Hugh R. Sharp are required to don a safety immersion suit in less than 60 seconds. The safety immersion suit is more commonly referred as a “Gumby Suit”. The suit is quite impressive, being both insulating and buoyant. It possesses a safety whistle, flashlight, interpersonal locking hooks, and even an inflatable pillow. It is reassuring to know that above all else, safety is the primary focus of the leadership on this vessel. Being on duty from Midnight-Noon causes me to miss the opportunity to observe sunsets at sea on most nights, but I have been able to experience a few and they are simply the most breathtaking sunsets that I have ever seen. 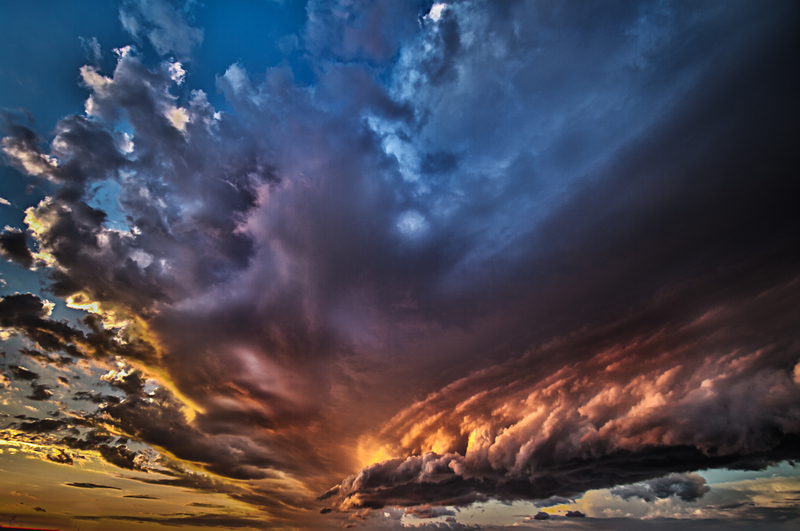 Watching the night divide the day is both awe-inspiring and thought provoking. Despite my colorblindness, I feel that I am still capable of absorbing all of the electromagnetic energy that the sun provides during this hour of magic. Dredge tows will be the focus of upcoming days, and is something that I am looking forward to. As a biologist, I find all living organisms infinitely beautiful and stimulating. I cannot wait. The Atlantic Sea Scallop Fishery is the largest & most valuable scallop fishery on planet Earth, valued at $580,000,000 in 2011. This entry was posted in 2013, Eric Velarde, NOAA Fisheries Service, NOAA Teacher at Sea and tagged HabCam V4, R/V Hugh R. Sharp, Sea Scallop survey, Severe Weather, sonar, Stereo Imaging. Bookmark the permalink. Great Gumby suit pic! Should be a hit back at school!